…it’s 2018 and you are in the car park of Fort Knox to take a special photograph. …it’s 2025 and you’re in the Nishitama district of Tokyo to deliver a package of unspecified contents. …it’s 2032 and a voice in your ear is guiding you to a vantage point over a business park in Madrid. 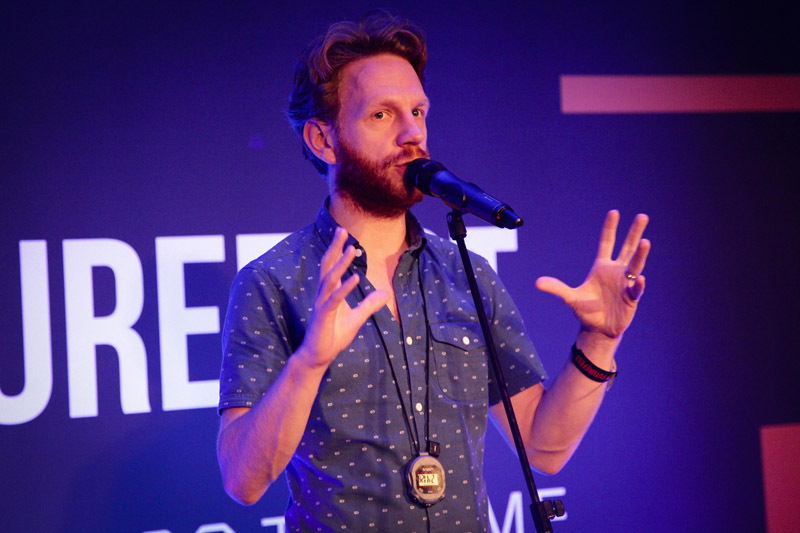 Over 200 attendees at Nesta’s FutureFest in September 2013 played out the future with Coney. FuturePlay is an immersive interactive performance that asks the audience to imagine the future through play. In a world where systems are becoming increasingly interconnected, it challenges them to make play inside these systems as a potential form of future of activism. A space is marked out on the floor and the audience are free to step into it and be in play in a series of futuristic scenarios, or stay outside in order to watch and take part in the bigger game that gradually reveals itself. FuturePlay incorporates writing from a mysterious thinker called Frankie Kuniklo, author of The Future Of Play: A Prophecy. Frankie himself makes a personal appearance in the piece, which might, just possibly, change the way you see the world and what it could become. FuturePlay was commissioned by Nesta for FutureFest at Shoreditch Town Hall, and Coney collaborated here with three other organisations – the disruptive thinkers of Glitchspring, the systems hackers of Playify, and the urban courier network of >CC – to make this first version. *not all is necessarily as it appears at first sight. Coney is here represented by Brian Ferguson, Joost Bos, Tassos Stevens, Will Drew and others. Devised by Brian Ferguson, Joost Bos, Tassos Stevens, Will Drew, with Hannah Nicklin & Neil Bennun. Reps: Adey Grummet, Afreena Islam, Alyn Gwyndaf, Jamil Keating, Michelle McMahon & Toby Peach. With thanks to Pat Kane, Nesta and the Rag Factory.